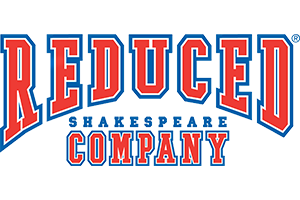 The Reduced Shakespeare Company is a three-man comedy troupe that takes long, serious subjects and reduces them to short, sharp comedies. Since its pass-the-hat origins in 1981, the “Bad Boys of Abridgement” has created ten world-renowned stage shows, two television specials, several failed TV pilots, and numerous radio pieces, all of which have been performed, seen, and heard the world over. The company’s itinerary has included stops off-Broadway, at the White House, the Kennedy Center, Lincoln Center, London’s West End, Seattle Repertory Theatre, American Repertory Theatre and Montreal’s famed Just For Laughs Festival, as well as performances in Israel, Australia, New Zealand, Hong Kong, Japan, Malta, Singapore and Bermuda, plus countless civic and university venues throughout the USA, the UK, and Europe.